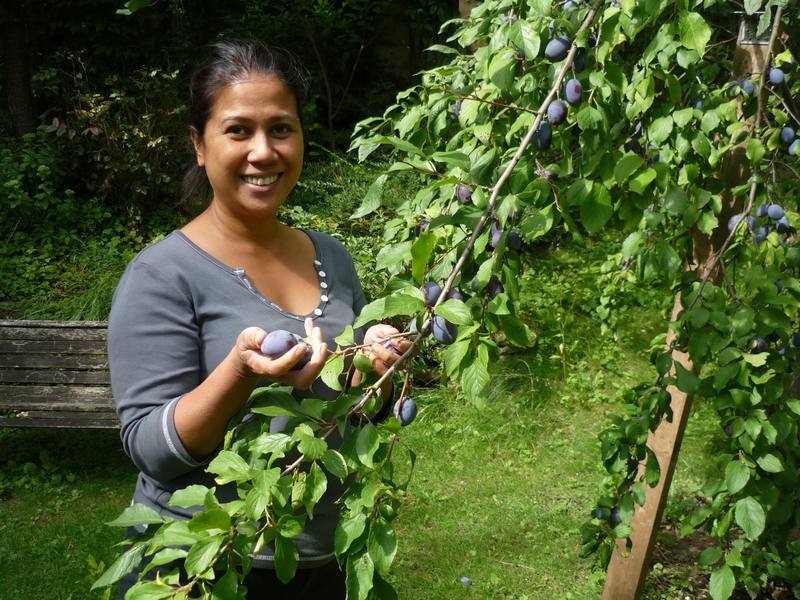 My two plum trees are heavy with fruit, so heavy that their branches are literally kissing the grass. From afar, they look like weeping willows with ripe plums for tears. I’ve been checking them for the last three days…hesitating if I should pick them up just about ripe or ripe, not knowing exactly if the level of softness is some kind of an indication. 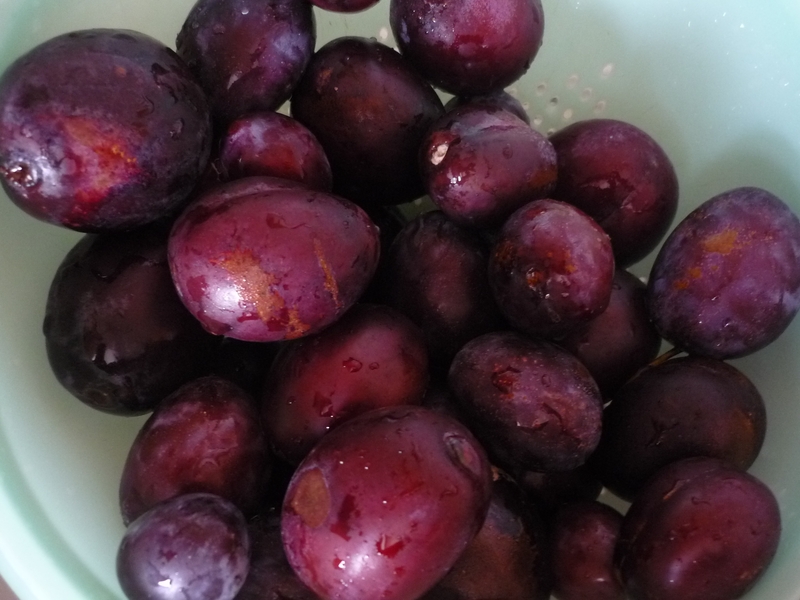 To be truthful, I’m a little bit lazy to pick them but I’m at the end of my procrastination…its plum picking time. 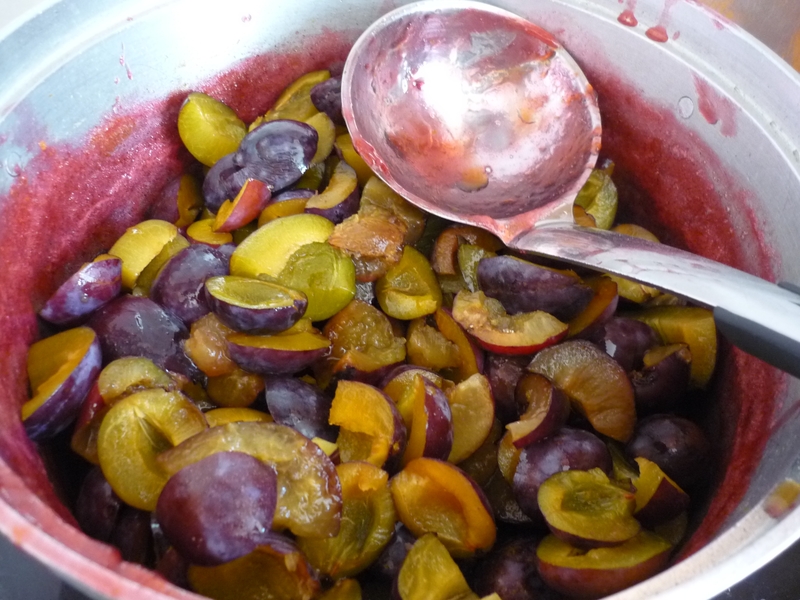 Twenty kilos of plums. What do I do? I have no inspiration for tarts so the next best thing and the easiest (in my opinion) is to make jams. Once made, they keep forever, except that at home we consume one jar of jam a week so my jam stock does not carry “eternity” as an expiration date. 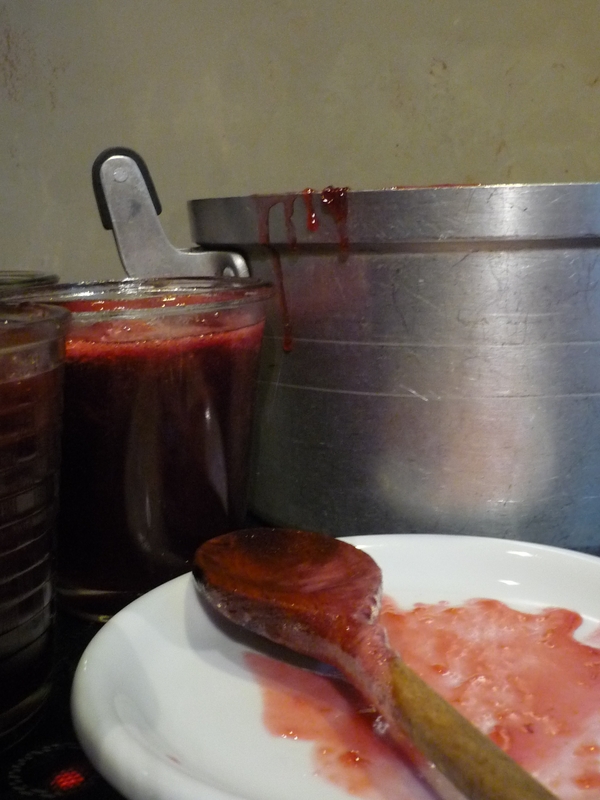 I also believe that we should all make our own jams, our own peanut butter, our own chocolate spread (and why not grow our own vegetables, sew our dresses, paint our walls….) The time you spend in making them is time you don’t spend in eating them. This is a five-minute thing which actually takes me ages because I multi-task at the same time. This time, I got consumed with a book I bought on sale, simply because it had “bakery” on the title. It’s like grabbing any product at the supermarket with “sugar” on the ingredients list. I got worried, though, that a book on sale is probably a bad book but it turned out to be a very interesting discovery of a new author to follow. 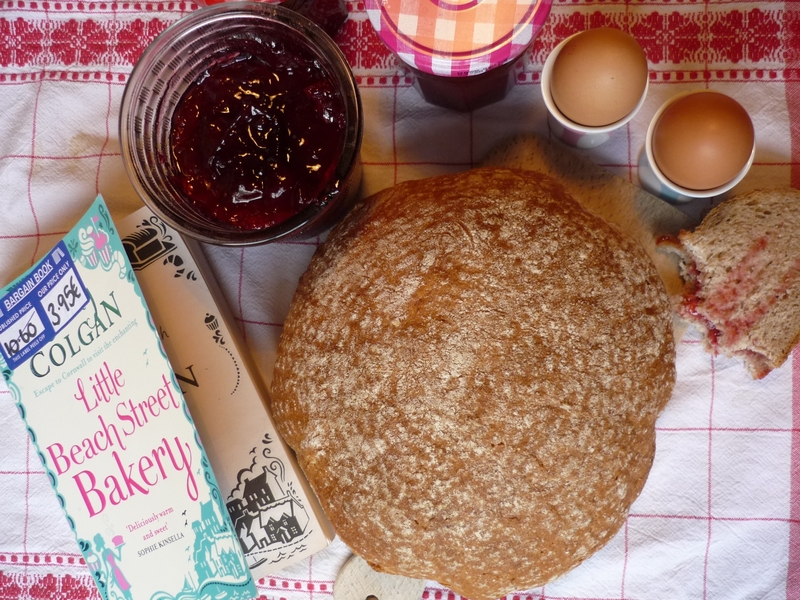 “The Little Beach Street Bakery,” by Jenny Colgan, author of bestselling novels. She also wrote “Meet me at the Cupcake Cafe,” “The Loveliest Chocolate Shop in Paris,” and many sweet-toothed books. Before flipping the first pages, I washed my fruit and left them to dry. Then, I took out my heavy casserole that I inherited from my mother-in-law, my weighing scale, a wooden spoon and my recycled jars. I am a firm believer of recycling but I don’t enjoy scrubbing old labels from used jam pots. My arthritis-finger is complaining. Next time, I should remember to soak them overnight in soapy water. Cut the fruit in quarters. Sometimes, I leave a stone or two (seed, in another language). Grandmothers say it gives jam a better flavour. I do batches of two kilos, add my secret ingredient Pec-plus (a gelifying agent), and cook on low fire for about 20 minutes. I like to slow-cook my fruit until they are tender. And I know that the purists will crucify me for using an industrial pectin when I know that lemon juice would do the trick. But I’m lazy today and decided I was not pure and besides, I don’t have a lemon. So, the book talks about the life of Polly. She could have been well called Louise. Oh dear, story of my life – an island, at a crossroad of a career change, and baking. And so current – written, published, reprinted and bargained in 2014. This is the kind of book that speaks of a character whose arrival in a small village stirs it from its sleepiness or tranquility, similar to the book “Chocolat,” a shop that made an entire neighbourhood alive. This book makes you want to bake and write your own novels. But i’m upset…. someone stole the storyline of my 10th unfinished book. How could you, Jenny Colgan? In between the chapters of Polly kneading her dough, making friends with a seabird, chatting with her botox-bimbo-bestfriend who does not eat potato chips and falling in love with a hipster – I keep an eye on the bubbly jam. 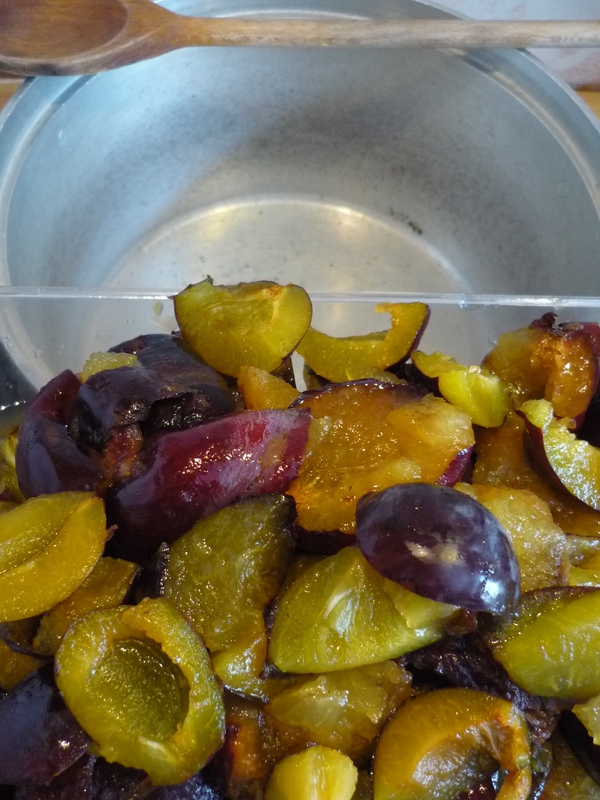 I wait until the fruits are well-cooked but with remaining chunks. I don’t like jelly-like jams. I want to keep pieces of fruit so when I spread it on my bread, I can feel my teeth digging on the soft, sweet flesh. Half of it will be juice. At this point, add granulated sugar. For two kilos of fruit, I only add one kilo and a half of sugar, even if all recipes say a kilo of sugar for a kilo of fruit. I find that too sweet and I prefer a bit of tanginess in my jams. Once you add the sugar, put on the high fire and stay close to your casserole. I give the same advice when caramelizing sugar – before starting, go and make a pee (and wash your hands!!!). You cannot leave one second once your sugar is on the stove. Same for jams. A one-minute boil should be good. 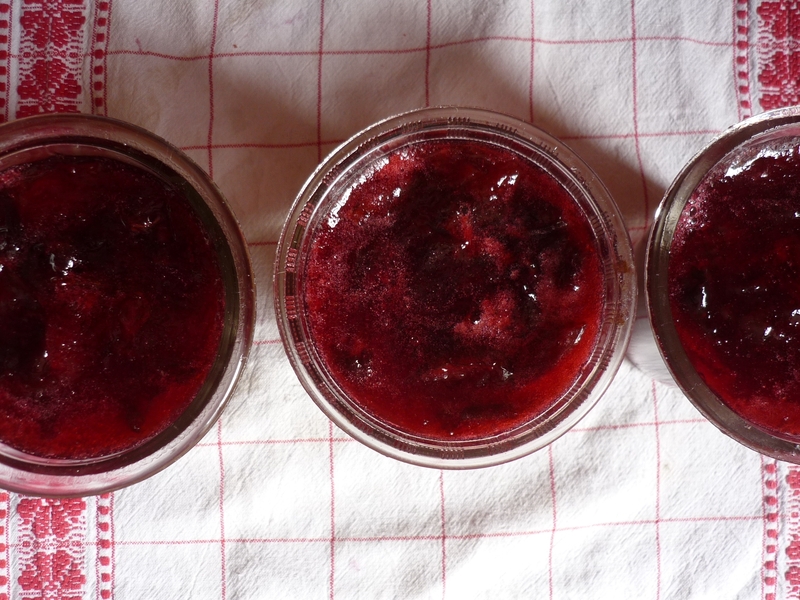 If you want to check if your jam is ready, carefully scoop a teaspoon of hot jam and drop it on a plate. If the jam does not “run,” it should be ready. Ladle on pots and close well. Some people turn the pots upside down to prevent air but I don’t and my jams stay mold-free even for three years (well, those that I forgot in my pantry). So, Polly starts from being an assistant in a bakery to becoming her own boss, receives a fantastic oven from a super rich acquaintance she just met (I have rich friends for more than 20 years and none of them gave me an oven) and ends up with a wealthy executive who turned his back on a well-paying job to become a beekeeper. Okey, okey…story quite predictable. Book talks about baking but not really giving enough technical details (unlike “Like Water for Chocolate” where sweat, tears, spirits and stolen kisses intervene in the final taste of a dish) but Jenny didn’t write a baking encylopedia anyway. Her books are sweet, light and entertaining. And the bonus are her bread recipes, found at the back pages. Just what I need – good bread to devour with my fifty pots of jam.